A Canadian citizen is calling on the Chinese regime to release his father from a detention centre in China, where he has been held for his belief in Falun Gong for eight months without any contact with family members or access to a lawyer. Toronto resident Li Zhe’s father, Li Xiaobo, had suffered severe torture during an earlier eight-year prison sentence. He is among some 10 known family members of Canadians currently imprisoned in China for their spiritual belief in Falun Gong. 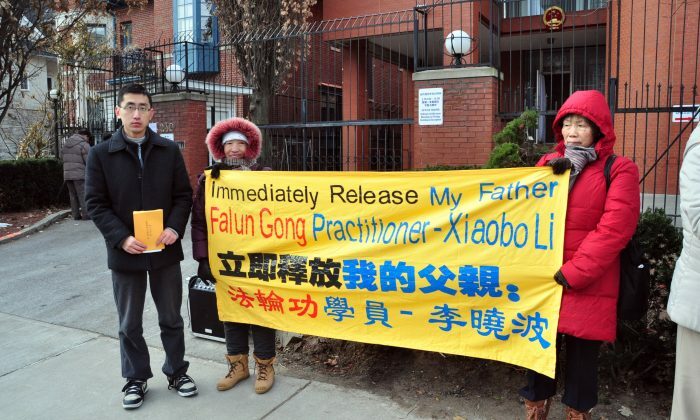 Li Zhe led a rally in front of the Chinese consulate in Toronto on Dec. 19, appealing to Chinese leader Xi Jinping to aid in his father’s release as well as give justice to Falun Gong. “I sincerely wish that you will put an end to the persecution of Falun Gong and release my father, Li Xiaobo, along with all other Falun Gong practitioners who are imprisoned, including all those with Canadian family members,” wrote Li Zhe in an open letter to Xi Jinping. It was in 1996 that Li Xiaobo began practicing Falun Gong—a meditation and self-cultivation discipline based on the principles of truthfulness, compassion, and tolerance. Li Zhe remembers his father’s character transforming after he took up the practice. “He quit his 20-year smoking habit that same year, he became a calmer person who no longer lost his temper, and his overall heath also improved,” he said. Shortly after starting to practice Falun Gong, Li Xiaobo became the general manager of a real estate company with many employees. After he began applying his belief in truth, compassion, tolerance to his workplace and everyday life, he became well known for his virtue and kindness. “He always put the benefits of his employees first, never sought personal gain, and treated everyone with generosity while being very disciplined himself. … Someone who had once worked as his assistant told me: ‘Your father is the most virtuous man I have ever met,'” said Li Zhe. Three years later, in 1999, Chinese Communist Party leader Jiang Zemin banned Falun Gong due to fear that its popularity was outshining the regime. Jiang launched a violent persecution against the practice, including a hate propaganda campaign against its adherents. Li Xiaobo remained undeterred, however. He had experienced numerous mental and physical benefits from practicing Falun Gong and refused to give up his belief despite the immense pressure. He began to write articles to expose the false information the Chinese regime was spreading about Falun Gong, and to let people know about his positive experiences with the practice. Li Xiaobo was arrested in 2004, and put on trial the following year. With no lawyer permitted to represent him and no family members allowed to be present, the trial lasted less than 30 minutes and he was sentenced to eight years in prison. “In those eight years my father suffered severe mental and physical torture. He was forced to stand naked in ice-cold water in the winter, and to stand for long periods of time while being deprived of food and sleep,” said Li Zhe. Due to the harsh conditions and severe torture he suffered in custody, by the time he was released in the spring of 2012, Li Xiaobo was almost blind in one eye. In April this year, father and son were both arrested for distributing information to local residents in their area about Falun Gong. Li Zhe was sent back to Canada due to his Canadian citizenship, but his father remains at the Longquanyi detention centre in Chengdu City, Sichuan Province. He has been denied a lawyer and outside contact with family and friends. In the past eight months Li Zhe and his friends have constantly appealed for his father’s release through phone calls, letters, and text messages sent to the local authorities as well as local citizens. Upon learning that Li Xiaobo was abducted due to his efforts to inform them of the facts about the persecution, some local residents went to the police station to demand his release, said Li Zhe. Prior to Prime Minister Stephen Harper’s brief trip to China in November, the Falun Dafa Association of Canada (FDAC) had written to him asking for his help to urge the Chinese regime to stop the persecution of Falun Gong, and provided a name list of the 10 imprisoned Falun Gong practitioners who have Canadian family ties, including Li Xiaobo. Calgary resident Huang Jinling later received a phone call from a Canadian government official informing her that the prime minister had raised the issue of her daughter, Chen Yinghua, also among the 10 imprisoned family members of Canadians. “As more and more people learn about the facts of the persecution and make their choice based on their conscience, the evil and lies will ultimately die out,” said Li Zhe in his letter to Xi.